← “Life is short. Have an affair.” Will adultery go viral? And that’s why the New York Times can run a headline (in the Sunday Styles section…), Adam Smith, Marriage Counselor. It’s a bit of a stretch. But when you come up with a sure-fire title for a book like “Spousonomics” (not to be confused with “home economics,” which was a whole nother thing — or is it? ), all that remains is to find a bundle of theory and anecdotes to fill up the space between the covers. I haven’t read the book yet, so please take that as a plug and not a dis. I had just spent two years writing a book about how to have a better marriage. One secret, my co-author and I concluded, was to think like an economist: apply the rational laws of Adam Smith, as well as recent findings about why we do some of the weird things we do — mining the field of behavioral economics — to increase marital happiness. Is that the way we want to think about a successful marriage?! Can “you scratch my back and I’ll scratch yours” get you all the way “until death do us part”? Of course, incentives and mutually advantageous arrangements can help in both cooperative and competitive endeavors. And a family should surely be more about cooperation than competition. It is also worth remembering that Adam Smith never claimed that humans could be moved only by the pursuit of their own self-interest. 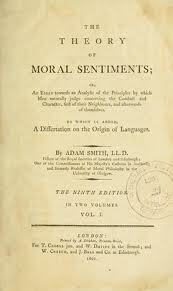 The ability to sympathize and empathize with others, and to be moved to act on the basis of their needs was, for Smith, equally a part of human nature. How selfish soever man may be supposed, there are evidently some principles in his nature, which interest him in the fortune of others, and render their happiness necessary to him, though he derives nothing from it except the pleasure of seeing it. Of this kind is pity or compassion, the emotion which we feel for the misery of others, when we either see it, or are made to conceive it in a very lively manner. That we often derive sorrow from the sorrow of others, is a matter of fact too obvious to require any instances to prove it…. This entry was posted in invisible hand, non-adversarial institutions, political philosophy and tagged Posted by Wayne Norman. Bookmark the permalink.